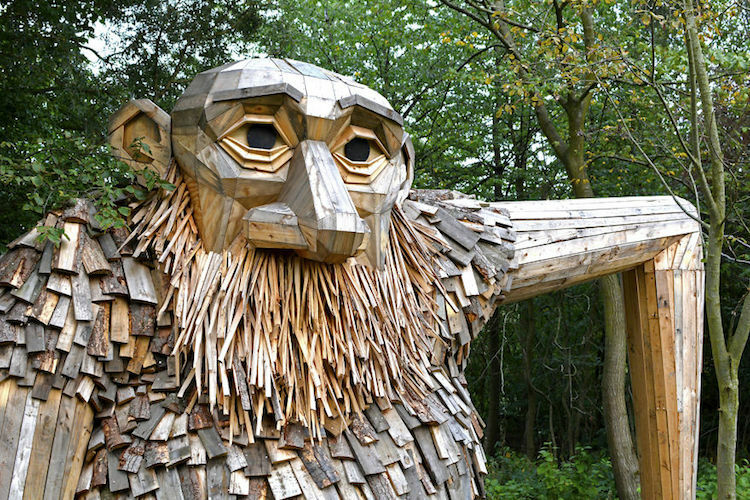 For about 3 years, Thomas Dambo, a Danish artist, has been using recycled materials to create huge sculptures. 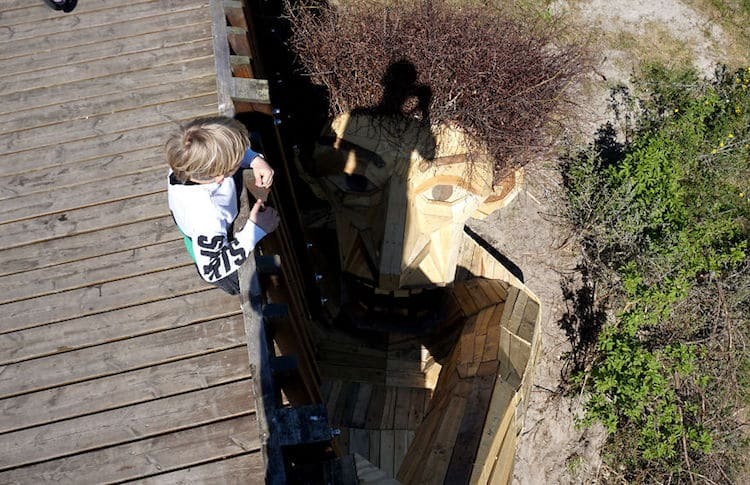 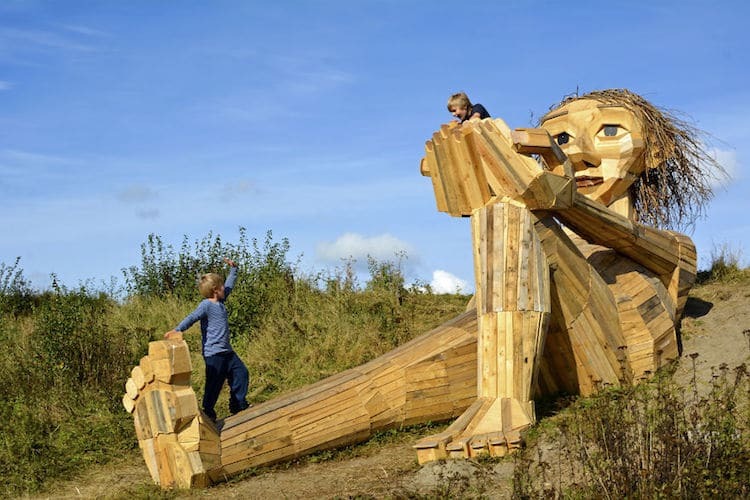 In 2017, he placed six friendly giants around the Copenhagen territory in order to encourage people to spend time outside and visit the offbeat parts of his beloved city. 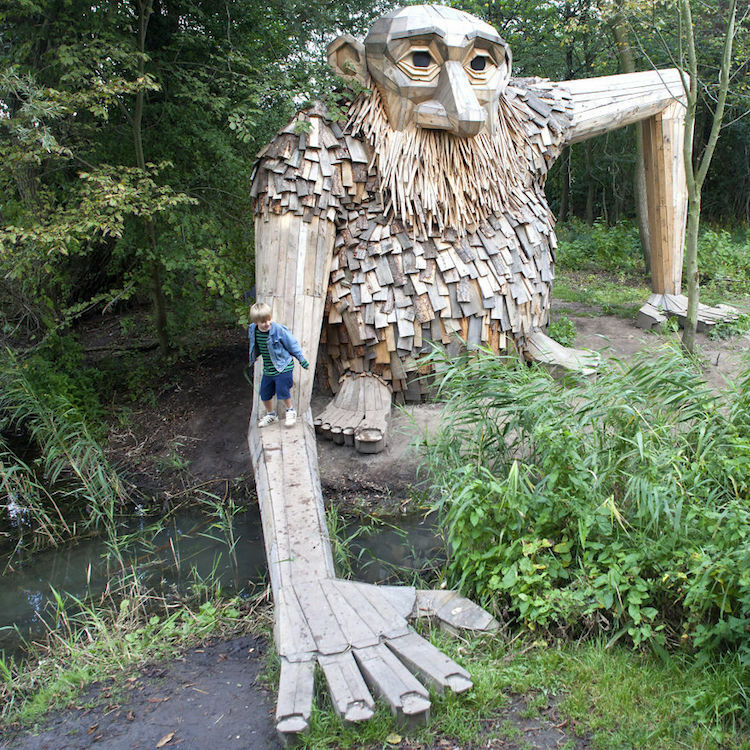 The giant sculptures were built with groups of local volunteers. 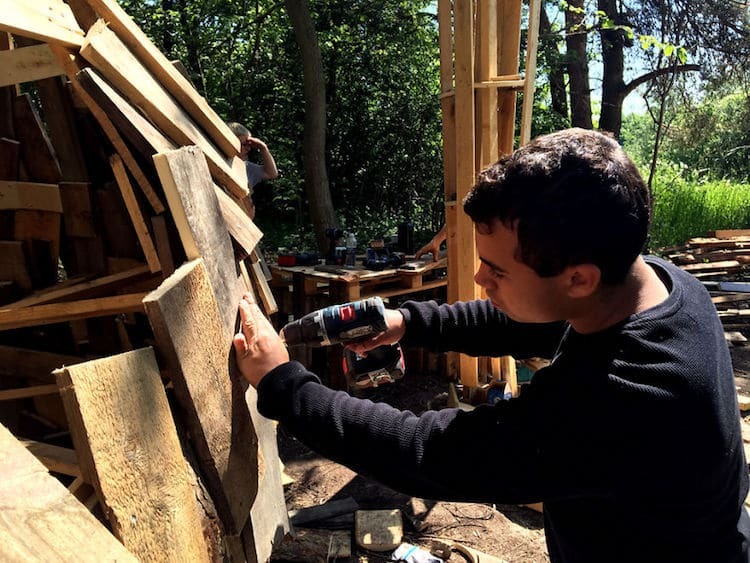 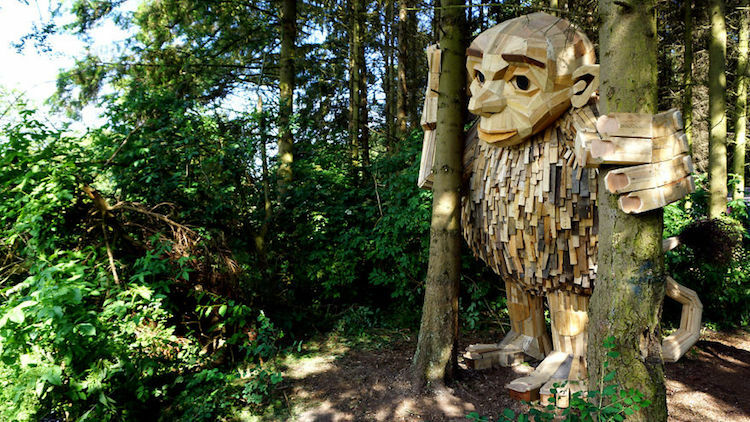 These hidden characters made from recycled wood actually required 600 wooden pallets, a shed and an old fence to be fully assembled. 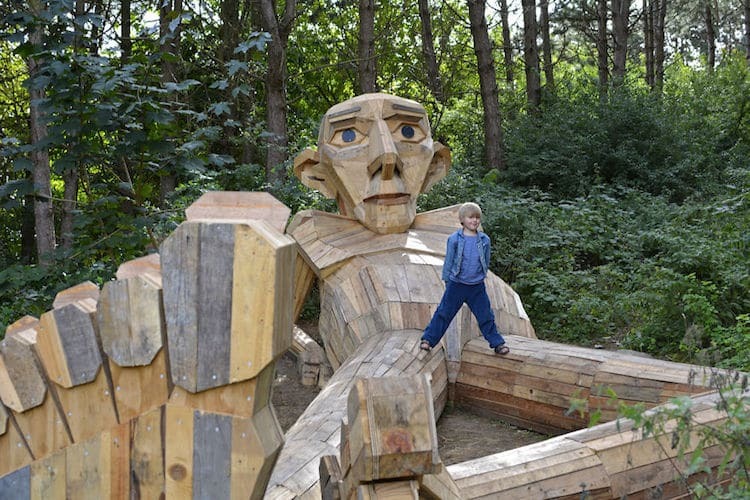 Each giant is named after a volunteer. 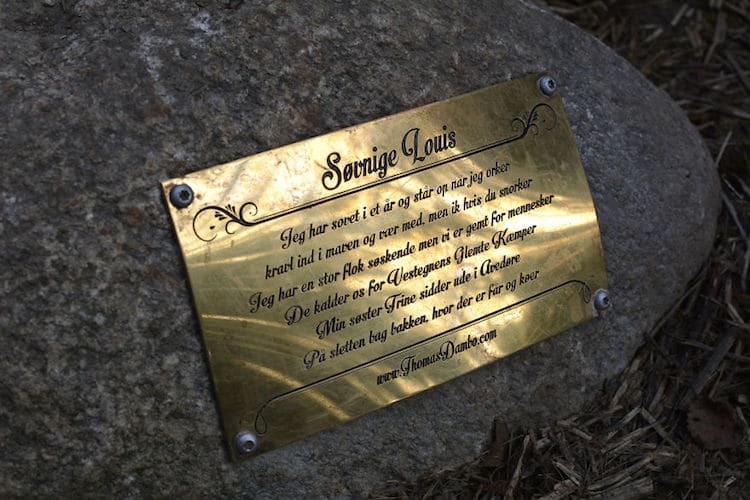 To find them, people can use a map prepared by Dambo or find the poems engraved in some stones close to every sculpture. 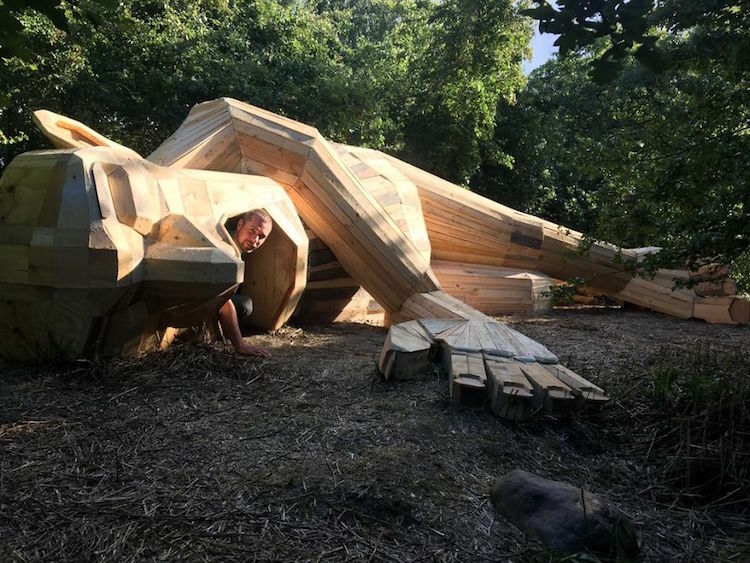 The artist said: “It invites the viewers to go on a treasure hunt, not only to see the sculptures, but also to discover hidden gems in nature”. 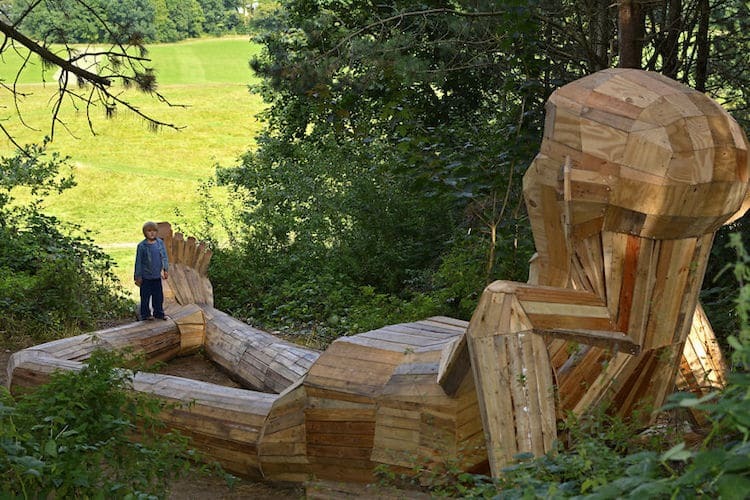 Each artwork is wisely placed in the environment. 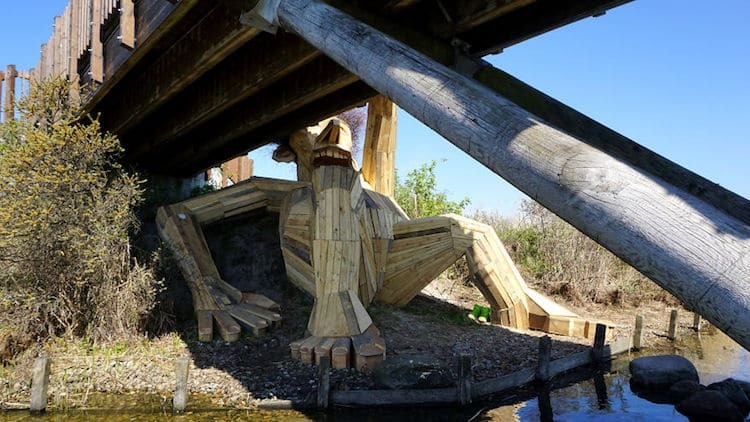 Per example, Teddy Friendly, which provided work for four unemployed people in partnership with a local activation center, sits next to a lake. 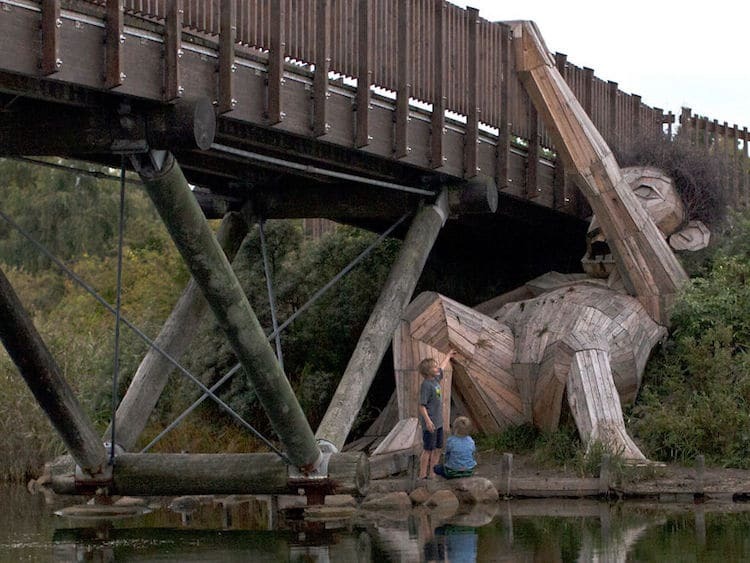 His extended arm helps people to cross the little stream that flows into the river. 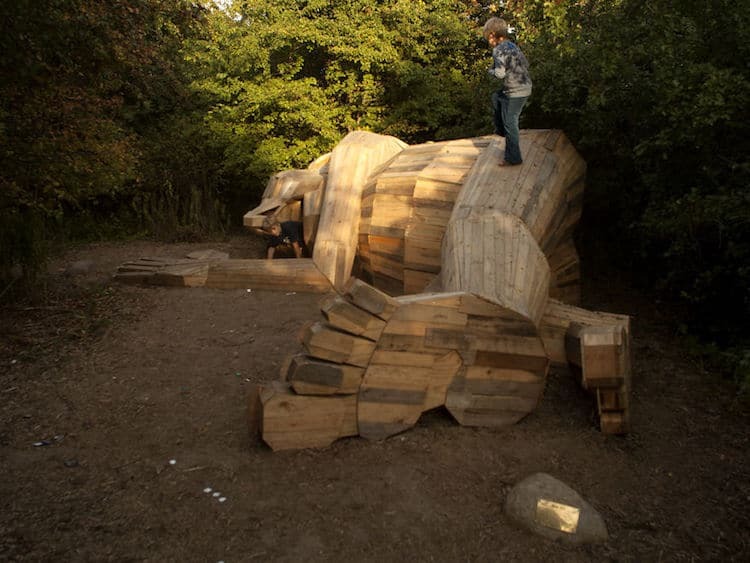 Little Tilde, which can be found in an area full of nature and wildlife, provides a home for the animals she can idly watch. 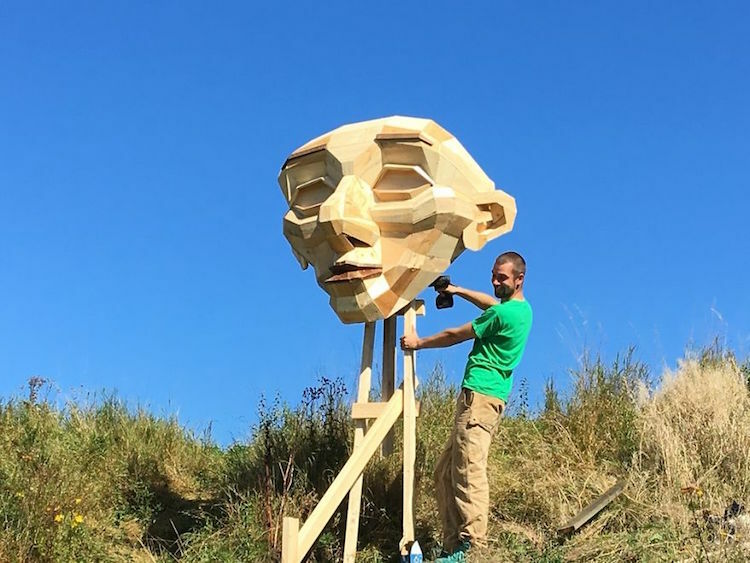 This sculpture counts 28 bird houses. 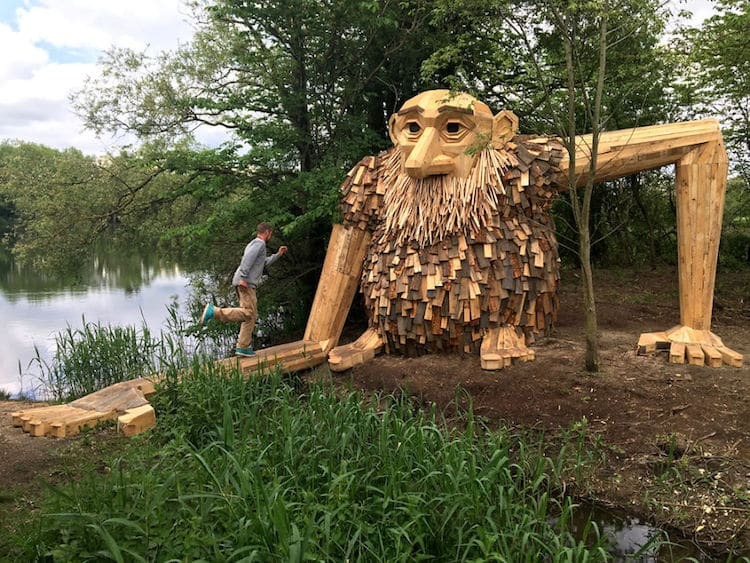 Scroll down to take a look at these six enormous sculptures made out of scavenged wood, but don’t be shy to go and hunt for them in Copenhagen’s wood. 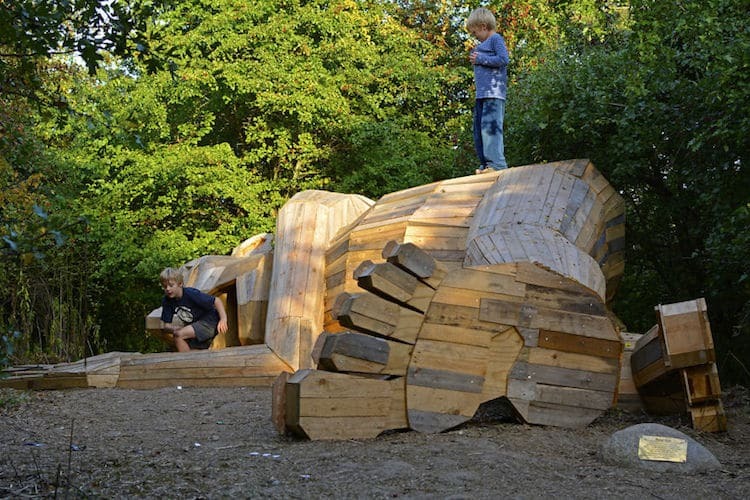 The artist encourages people to go on a treasure hunt around Copenhagen to find the giant sculptures. 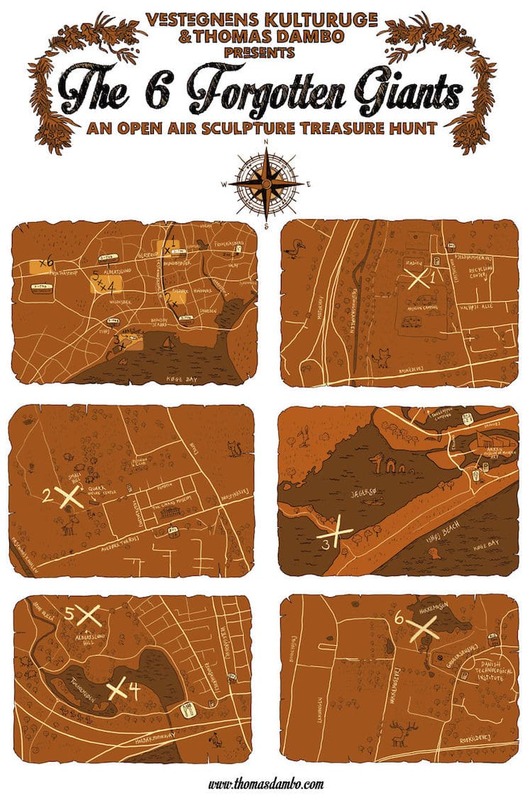 They can use the map or clues found in poems near each artwork. 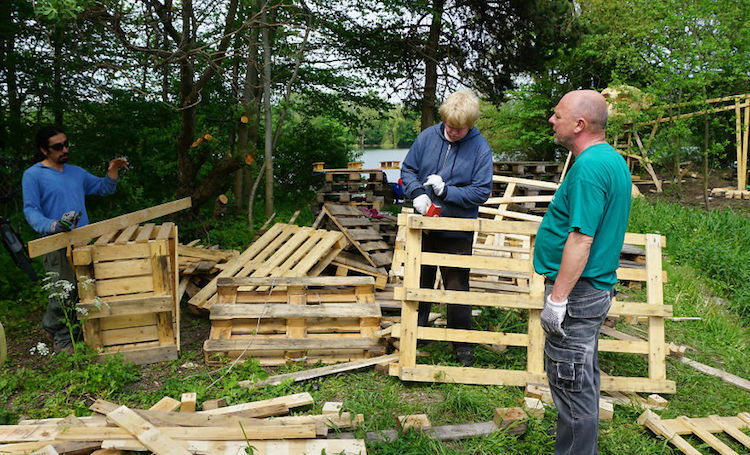 The volunteers that helped Dambo joined the project with all kinds of experience. 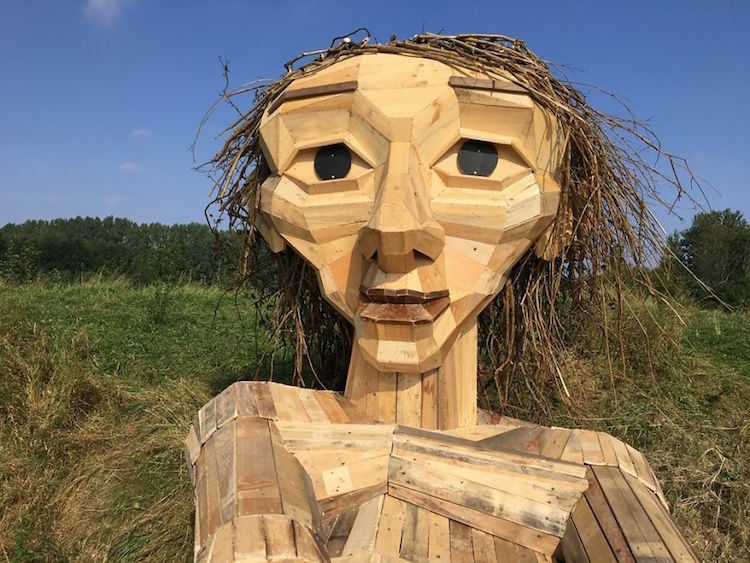 You can also watch this VIDEO to learn more about how the project took place.